Nintex is the world’s leader in intelligent process automation (IPA) with more than 7,500 enterprise clients and an extensive global partner network across 90 countries who have automated, orchestrated and optimized hundreds of manual processes. With its unmatched breadth of capability and platform support delivered by unique architectural capabilities, Nintex helps line of business owners and IT departments accelerate progress on digital transformation journeys. Nintex Workflow Cloud®, the company’s process automation platform, connects with all content repositories, systems of record, and people to consistently drive successful business outcomes. Forrester Research has named Nintex a Leader in The Forrester Wave™: Digital Process Automation For Wide Deployments, Q1 2019. Nintex received the highest scores in two of the three main evaluation categories, strategy and market presence, and reported among the top scores in six of 10 top-level criteria. Nintex, the global standard for process management and automation, today announced Forrester Research has named Nintex a Leader in The Forrester Wave™: Digital Process Automation For Wide Deployments, Q1 2019. Nintex, the global standard for process management and automation, today announced its acquisition of Robotic Process Automation (RPA) provider EnableSoft, maker of Foxtrot RPA, to bring Nintex customers and partners powerful, easy-to-use RPA capabilities with the fastest time to value. Nintex, the global standard for process management and automation today announced a strategic partnership with Adobe to bring new native electronic signature capabilities, called Nintex Sign™ powered by Adobe Sign, to Nintex partners and customers. Where Can You Find Nintex? 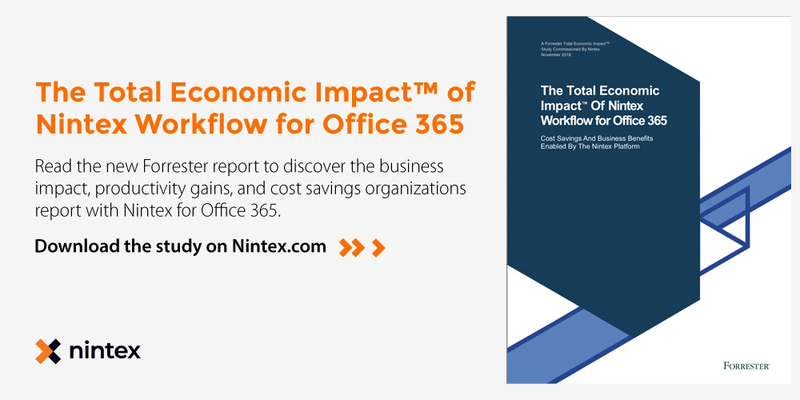 New study shows global enterprise organizations deliver workflows faster, save money and improve employee productivity by leveraging the Nintex Platform. Bellevue, WASH.—December 5, 2018—Nintex, the global standard in process management and automation, today released a new Forrester Total Economic Impact™ (TEI) study to help business and IT decision makers experience the significant business benefits and cost savings provided by the Nintex Platform. In today's episode, Sean Martin digs deeper into the idea that risk and security management for SMBs is possible. Sean gets some tremendous insights from Monica Bush who shares how she joined Nintex to help bootstrap their risk, security and compliance program, taking it from its infancy stage to one of growth and continued improvement. So just what do cybersecurity and business process management have to do with each other? In this 3-part series, Ryan Duguid, Sr VP of Technology Strategy at Nintex, chats with Sean Martin about connecting cybersecurity with business process management. In part 2, they cover the question: how many processes can you automate – and why? So just what do cybersecurity and business process management have to do with each other? In this 3-part series, Ryan Duguid, Sr VP of Technology Strategy at Nintex, chats with Sean Martin about connecting cybersecurity with business process management. In part 1, they explore the value of formal asset and identify management. It feels normal and right to think that a business process should be modeled and designed from start to finish in a single place. Make it one workflow, and everyone knows what to do, you can monitor the workflow, and if you need to make changes, you know exactly where to look. Simple, right?